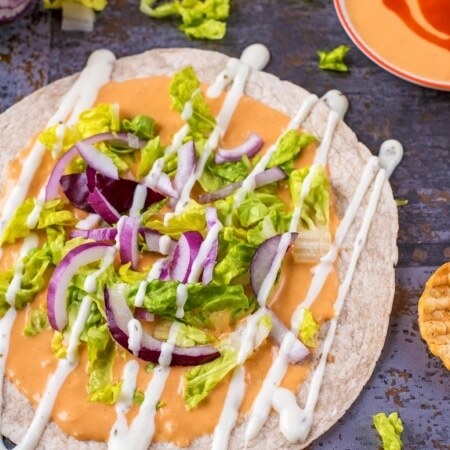 These look delicious, I’m big into these sorts of recipes so will have to give it a go. I must admit I’m a salted pop chips girl – I could eat them quite literally all day! Yum!! I love the idea of putting this on a flatbread! So yummy! I have yet to try making my own hummus, but I really should because I love it. Hummus is currently my snack obsession. I prefer it spicy. I haven’t tried w/ pop chips yet. I actually fell in love w/ pop chips on my last flight. I need to get some and try out w/ this new hummus I’m sure I will love. For a second I was wondering if the popchips might ened up in the hummus…now there’s an idea! This definitely looks like the tasty kind of lunch I’d enjoy. Better buy myself some popchips! 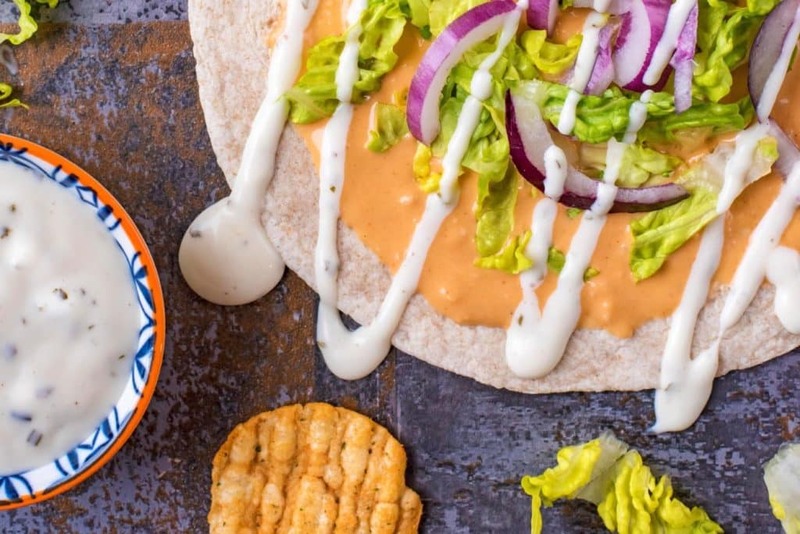 These flatbreads look incredible – love the flavours, this is the perfect lunch idea! 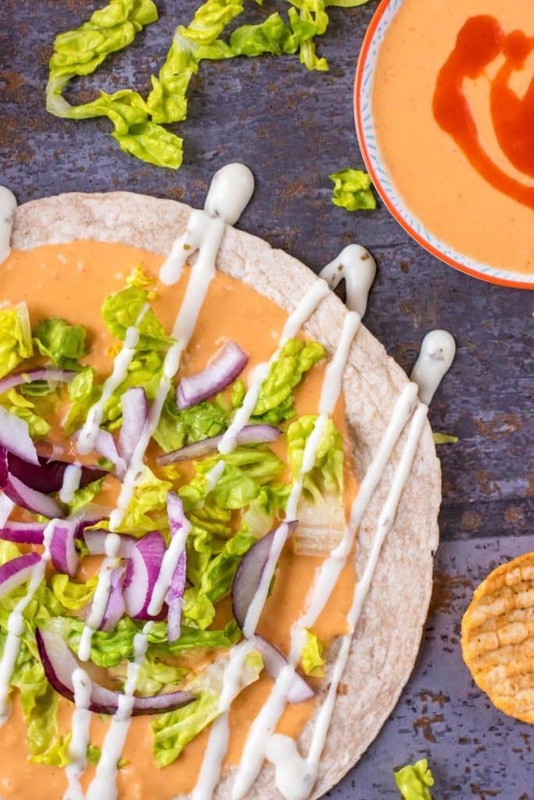 This looks as quick to make as they do delicious! It’s amazing how many different types of hummus you can make with a few additions. Love pop chips. They are irresistible, though I’ve not tried either of the two flavours you’ve mentioned. 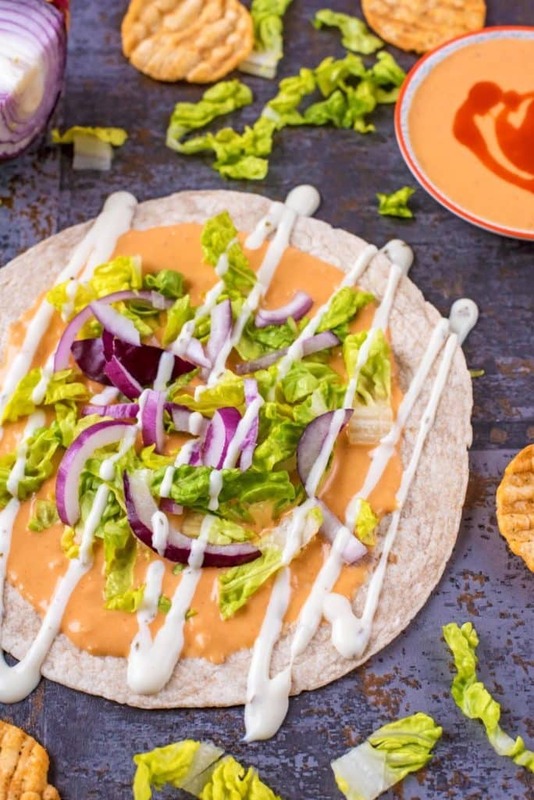 I love hot sauce, but have no idea about buffalo sauce. I’m obviously missing out. I can only imagine how great these flatbreads taste. They look gorgeous! Oh, and I love Popchips! I don’t know why I have never made my own hummus, as it looks dead easy. Not a fan of anything spicy, but I will give that basic version a try. Thanks! I wish this was my lunch today. I just have a boring egg sandwich. I will give it a try next week though, as I need to change things up a bit. I love hummus! I need to try this recipe…yumm! 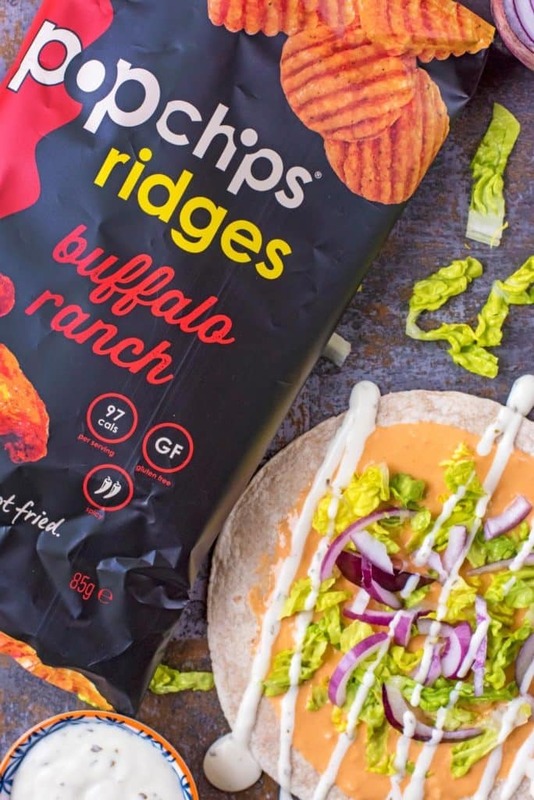 love the flavours going on in the buffalo ranch hummus, and these pop chips look so delicious. 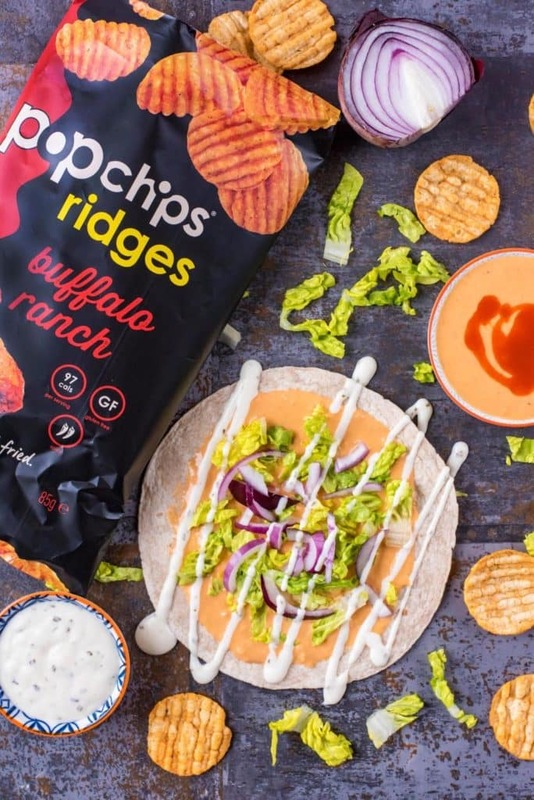 Oh wow, the buffalo ranch pop chips look amazing, I’ve not yet seen them in stores but I’ll have to pick them up! They look delicious! oh, It looks delicious and tempting. I will definitely try to make this for my hubby. I am pretty sure that he would really love this. I had never heard of Popchips before reading this, but they look great. I’m pregnant at the moment and hummus is like an addiction for me! Buffalo ranch is one of our favorite flavor combinations. What a fun way to combine the flavors! 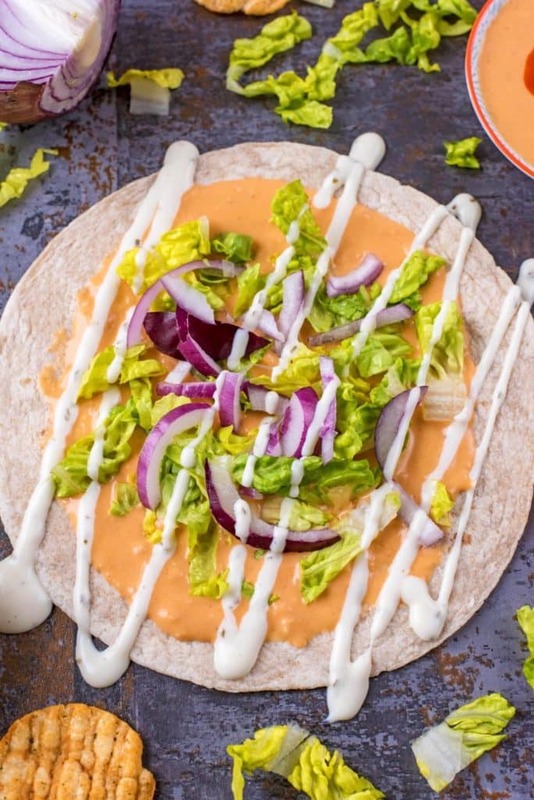 I love hummus WITH anything and ON anything, so this lunch is right up my street! Thank you for a great recipe. 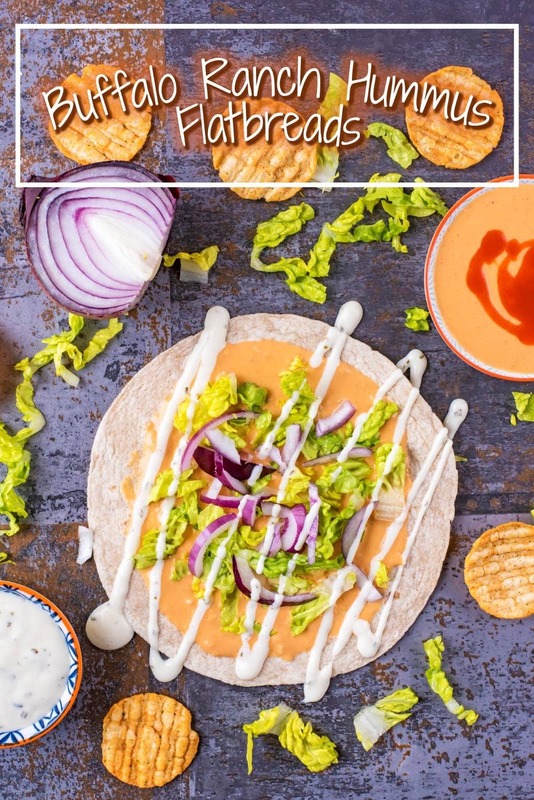 I love hummus and how versatile it can be. Pop Chips are also my favourite snack of choice, so tasty!